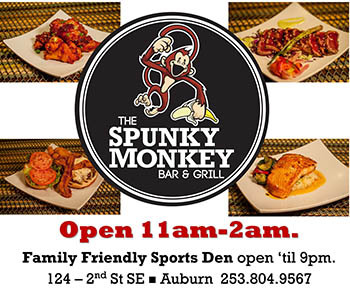 (Auburn, WA) You had to be 10-years-old to get into Longacres Race Track in Renton back in the late 60’s when 8-year-old Frank Lucarelli began attending the races but his Dad was an owner and had a box and knew some people plus Frank was big enough to pass for 10 and it wasn’t like they were carding 8-year-olds. This is when Lucarelli caught “the bug”, the horse racing bug and very few ever shake this condition when they catch it. Lucarelli’s other love was baseball and he was good at both of his passions. 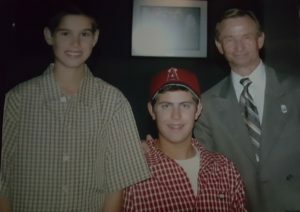 His Dad would take him to his Little League games where Frank began his development into a top notch pitching prospect. Even though baseball and horse racing in Washington State were the same season, Spring to early Fall, he never had to make a choice. Lucarelli found time to get to the races on weekends and eventually began working part-time for his Dad’s trainer Neil Knapp. Some Saturday’s he would spend his early morning hours cleaning out stalls and hot walking and hit the baseball field by the afternoon. Lucarelli loved to be at the races to watch the horses he cared for run but he never got into the gambling side of the sport. He appreciates the necessity for gambling but felt more comfortable with the competitive side of the game leaving the exacta boxes and betting strategies for others to figure out. Lucarelli eventually was a groom for Knapp and remembers fondly his favorite horse in Knapp’s barn was Made’s Bold Son. Made’s Bold Son was a multiple Stakes winner at Longacres taking the Seattle Handicap in 1974 and then reeling off wins in the Space Needle and Governor’s Handicap in 1975. 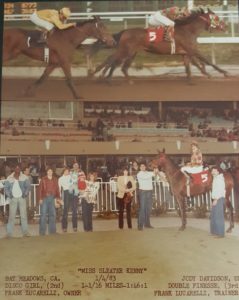 He ran 3rd in the Washington Championship in 1977 in his last Stakes race at the Renton oval and got his final win in June of 1980 in a claiming race then retired in 1981 with career earnings near 140k. This preparation helped Frank be ready to take the step into the training ranks when he was ready for it. In August of 1979 he took his test and began a lifelong journey. After easily passing his trainer’s license test Lucarelli headed right for the Longacres backstretch. Lucarelli did not start with a stable of horses he actually took over for Knapp for the rest of the 79 season at Longacres which helped him get his feet wet. He would enter his first horse, Jimmy the Hat in a Maiden Special Weight race on Saturday, August 18, 1979. The first time a Frank Lucarelli trained horse broke from the gate was in the 4th race but “Jimmy” would cross the finish line with 7 others in front of him. Lucarelli would then start Running Fleet on September 8 and pick up his first earnings as a trainer with a 4th place finish. Up next were Winnergreene and Wakarusa both finished 3rd then it happened on a Thursday, September 20 a horse named Tamborileo would win the all important 10th and Exacta race at Longacres for Lucarelli’s first career training win. Little did he know 39 years later he would make the walk to the Winner’s Circle another 1,682 times. But between win #1 and #1,683 there would be some tremendous high’s and incredible lows both professional and personal. 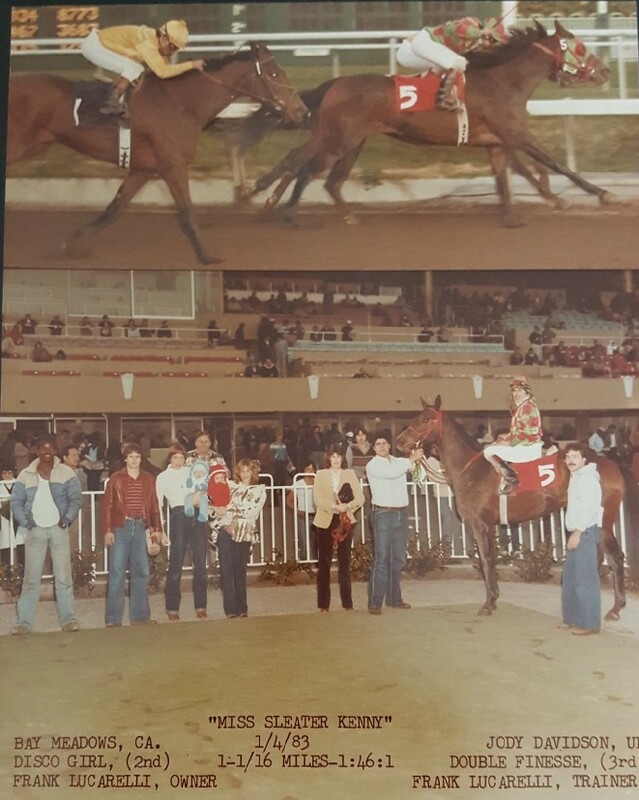 Let’s focus on his professional in this section and it wouldn’t be long for Lucarelli to post wins 2 and 3 as Winnergreene and Windy Turn both won in Renton and before 1979 rolled into 1980 he would get a win at Portland Meadows with Ebony Spirit. Frank would finish 1979 with an impressive line of 12 starts with 4 wins and 2 3rds a 50% in the money total and a win rate at 33%. But like in many Pro-Sports it’s that Sophomore jinx that can bring you back to earth and the reality of what a grind the racing business is as he started 62 but only equaled his 4 wins from his 1979 campaign but did have 5 2nds and 9 3rds. He would finish 1981 with 9 wins and 55k in earnings and followed that with 131 starts 9 wins, 9 2nds and 24 3rds in 1982 picking up his highest winnings total to date in more than 71k. In 1983 his start total declined by nearly 50 with just 88 but make his 1st ever Stakes entry. After a pair of claiming wins with Star Aglow, Lucarelli entered her in the Prima Donna Handicap where she finished well out of it in 10th place. After topping out at 9 wins in 81, 82 and 83, 1984 he backpedalled to just 4 wins but would start Tokyo Tartan in the Rhododendron at Longacres and the North Vancouver Handicap at Exhibition Park in Vancouver BC but would run unplaced in both stakes. In 1985 Lucarelli would start moving back in the direction he had hoped for the past couple of seasons and would increase his in the money percent by 22 points going from 17% in 84 to 39% in 85 with 8 wins, 16 2nds and 13 shows and added 20k to his earnings from the previous year. He tried another stake this time at Portland but Yok Chi finished 5th in the Mt Hood Handicap. 1986 would see his 1st Stakes placing and came at a time he needed a boost in confidence in running in stakes added races. After finishing 13th with Donlark in the Washington Horse Breeders Sales Stakes in August of 86 it was Accipiter’s Prince who finally broke through at Playfair racetrack in Spokane. Accipiter’s Prince ran 3rd in the Playfair Mile Handicap. 1986 was a turning point and Lucarelli probably didn’t even realize it at the time but it would be the 1st time he hit double digits in win total with 12 and cashed in 80k in earnings his highest yet and it set the tone for a big 1987. In 1987 Lucarelli would set personal bests in starts with 175, wins with 21, 9 more than the previous year, 2nd place finishes with 19 and his winnings would take a massive jump from 80k to 141k and he would get his first stakes placings at Longacres. Things got interesting on June 4th when an unraced 2-year-old filly Nifty Misty Dawn hit the track and rolled to a win in her first start. Lucarelli would recall how he got “Dawn” from her breeder and owners the Hibbards who weren’t even sure they should attempt to race her because of her unorthodox confirmation. Lucarelli says there was no chance anyone would have purchased her at an auction because of how her motion was so out of whack but convinced the Hibbards to let him give it a shot and they did. After her maiden win she ran 3rd in the Washington Stallion Stakes and 2nd in the Mercer Girls Stakes. She would be turned out after the 2nd place finish for the rest of the year. 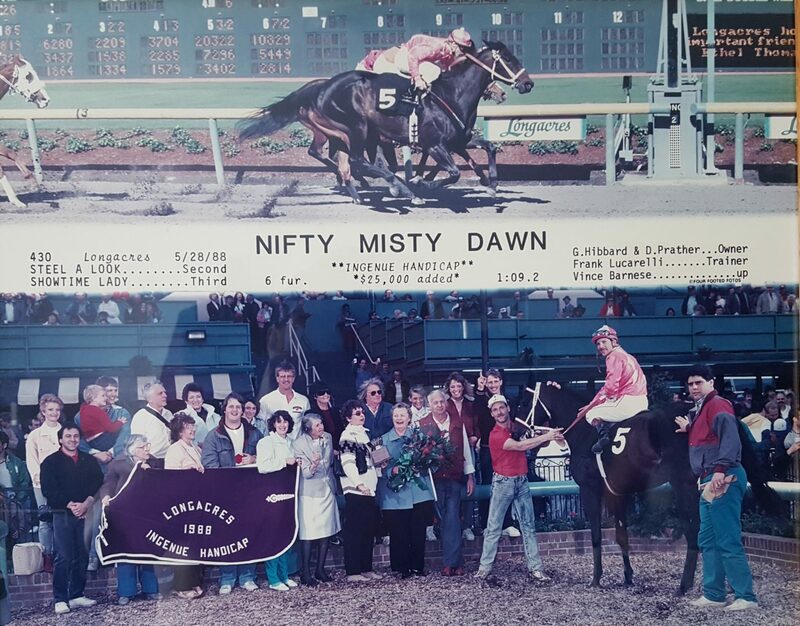 Thanks to Nifty Misty Dawn Lucarelli would have a very good 1988 not only did he crush his former earnings record with nearly 220k, 80-thousand more than in 87 but he would get his first Stakes win. 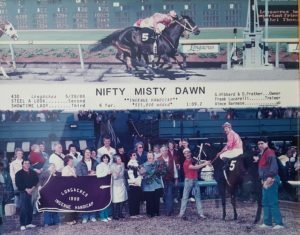 On May 28, 1987 in the $25,000 Ingenue Handicap Nifty Misty Dawn with regular rider Vince Barnese got up just in time to beat Steel a Look by a head and Lucarelli had his 1st Stakes win. Nifty would run 2nd, 3rd and 6th in 3 more Stakes races that year and was coming off that 6th place finish when Lucarelli entered her in the Washington Oaks. Barnese had been off her past 2 rides and got the call for the Oaks and it paid off with a clear 3-length victory over Drou a Way and Marvelous Wonder and benefitted her supporters going off at 20-1. NMD would finish a strong 88 campaign with a solid 2nd place finish at Bay Meadows in the Santa Clara Invitational Handicap. 1988 would also bring the Lucarelli’s much joy with their 1st child Anthony who was born on 12/21/1988. In 1989 he would regress in earnings but pick up 5 more wins and then in 1990 would again set personal bests in starts with 251, 31 wins and 228k in winnings but not only was Lucarelli dealt a punch to the gut but the entire Pacific NW racing industry when the owners of Longacres, the Alhadeff family announced they had sold Longacres to the Boeing Company and racing would cease to exist at the grand old track in 1992. Lucarelli finished up his run at Longacres with a solid 1991 but 92 he saw the doubt coming and several owners and breeders began taking a “defensive” stand not really knowing what the future of horse racing would be in Washington State. 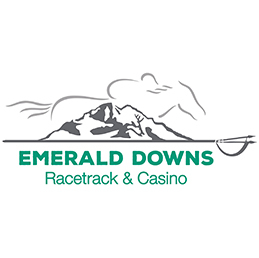 It was rough following the closure of Longacres with the Emerald Racing Association running 3 straight meets at Yakima Meadows. His annual earnings fell from a high of 253-thousand in 1991 to 120k in 94. Things were so uncertain he was down to 5 or 6 horses and took a job selling cars only going over on weekends to Yakima to train. Lucarelli with many others only hope was the Emerald Racing Association’s ability to build Emerald Downs in Auburn. There were many obstacles including zoning and wetland issues that could have knocked the project off line and pretty much marking the end of an industry in the State. But the ERA persevered and in June of 1996 Emerald Downs opened and the new era of horse racing was born in Washington State. With less than 6 months to run in that inaugural season Lucarelli only picked up 143-thousand in earnings in 1996. 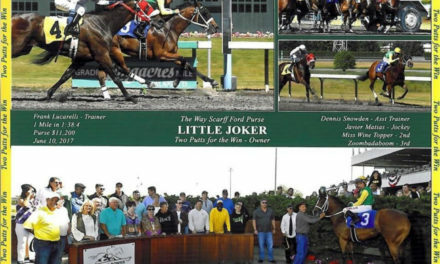 It took him more than a month to get his first Winner’s Circle Photo at Emerald Downs. It was on Thursday, July 25, 1996 and Antonio Castanon was aboard Mia Rolls who drew off to win a Maiden-claimer by 2 lengths as an odds on choice. 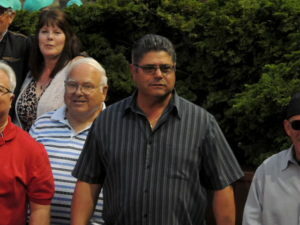 Little did Frank know at the time but 23 years later he would saddle another 926 horses that ended their day in the Winner’s Circle at Emerald Downs and finds himself 1 win behind the tracks all-time leading trainer Tim McCanna, 928-927. Before the Lucarelli’s would get to really enjoy their long-awaited success they would be challenged personally like they had never been challenged in the past. 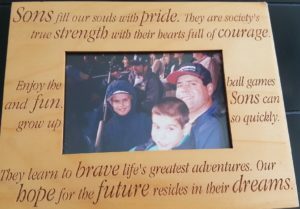 We chronicle the massive struggle and tragedy in the next section but in 1997 his oldest son Tony was diagnosed with a brain tumor. 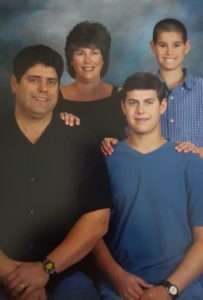 It would be a 7-year battle and in 2005 the Lucarelli’s did what no parent ever wants to think of doing and that was to lay their boy to rest as he succumbed to the deadly disease but not before putting up a valiant, courageous and inspiring fight. Frank’s professional career somehow would actually grow during this time. There were certainly huge swings of emotion and he credits his wife Pam and some incredible people who stepped up and helped him maintain his stable the many hours and days he stayed with his son. The racing industry was also going through some wild up and downs during this time as the uncertainty of the industry from the early 90’s hung over along with the huge expansion of casino gambling all impacted the horse population and breeding industry. 2008 maybe the year that Lucarelli finally admitted to himself he made it. It was by far his best year as he topped 1-million dollars in earnings for the 1st time in his career and cleared it by a mile with more than 1.3-million on the books. He would also start a record 535 and had 82 winners both personal bests. But it was this 2-year-old steal he and owner Chris Randall found at the Keeneland sale for $9,000 that took Lucarelli to another level. Gallant Son would lose his opener at Emerald but then go on to score big wins in the Premio Esmeralda Stakes at 8-1 then cruised to an impressive 6-length victory in the Gottstein as the 5-2 2nd favorite. Gallant Son was getting so good Randall and Lucarelli decided to take a swing at the 2-million dollar Juvenile Breeders Cup race. Regular rider Leslie Mawing got the ride and he finished a very credible 7th in the 12 horse field with only 3 and half lengths separating the top 7 finishers. 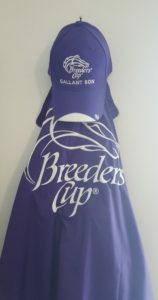 2008 was not just a “one trick pony” for Lucarelli he also won the Auburn and Seattle Slew Stakes with Fear No Evil. In 2009 Lucarelli would just miss his top earnings but still go over 1.3-million. 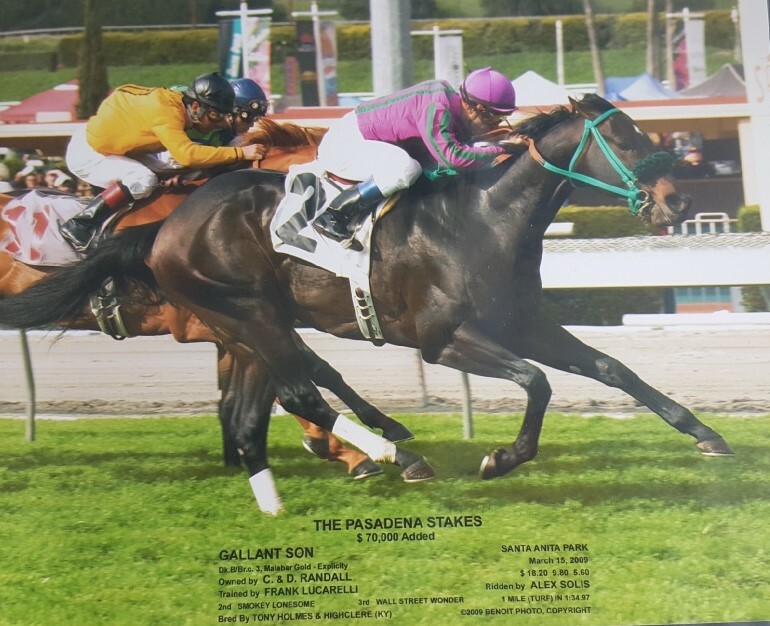 Gallant Son would be his lone Stakes win of the year in the Pasadena Stakes at Santa Anita, a black type win for Lucarelli. In 2010, earnings would drop a touch but he would record 5 Stakes wins but likely none as satisfying as the Jack Coady Stakes at Turf Paradise. Although just a $25,000 stake Michael the Man won it by a nose. 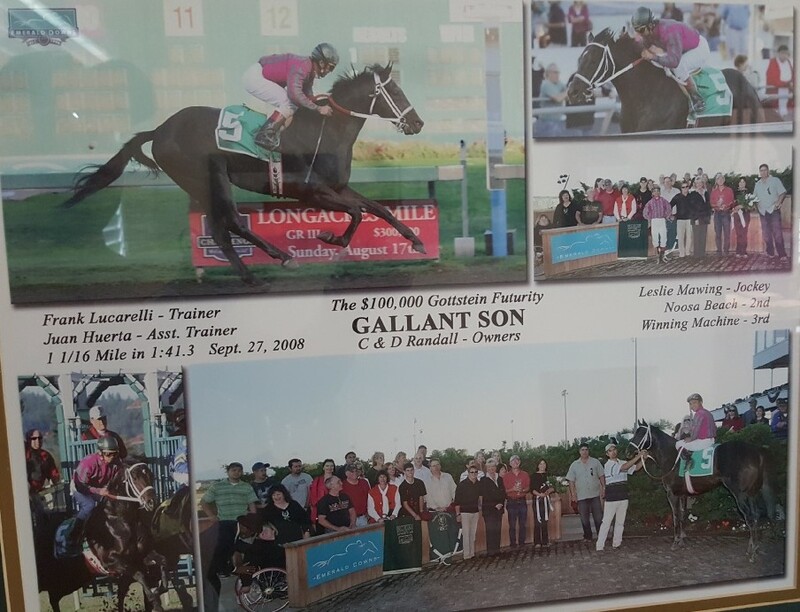 Michael the Man was owned and trained by Lucarelli and the horse was named after his 2nd son Michael. Gallant Son also continued to impress with a win over the Hollywood Park Turf course winning the Inglewood Handicap by nearly 2 lengths in a late April race. He would then finish 4th in the 250k Shoemaker at Hollywood just 2 lengths behind. In July he ran 3rd again less than 2 lengths from the win in the Wickerr Stakes at Del Mar setting him up for a run in the Longacres Mile in August. He would run an even effort finishing 6th just a neck out of 4th place but well beaten. His stablemate Winning Machine nosed him out for 5th place. 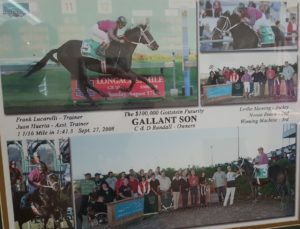 Here is a look at Gallant Son winning the Inglewood. 2011 was a new personal best in winnings and remains his PR with 1.55-million in winnings. 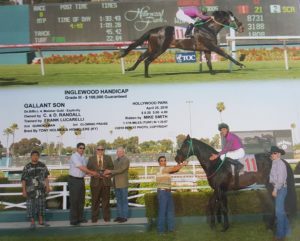 Lucarelli’s favorite horse of all time, Gallant Son, showed he wasn’t done yet winning the $80,000 Robert Kerlan at Hollywood Park getting up by a head with Mike Smith aboard. 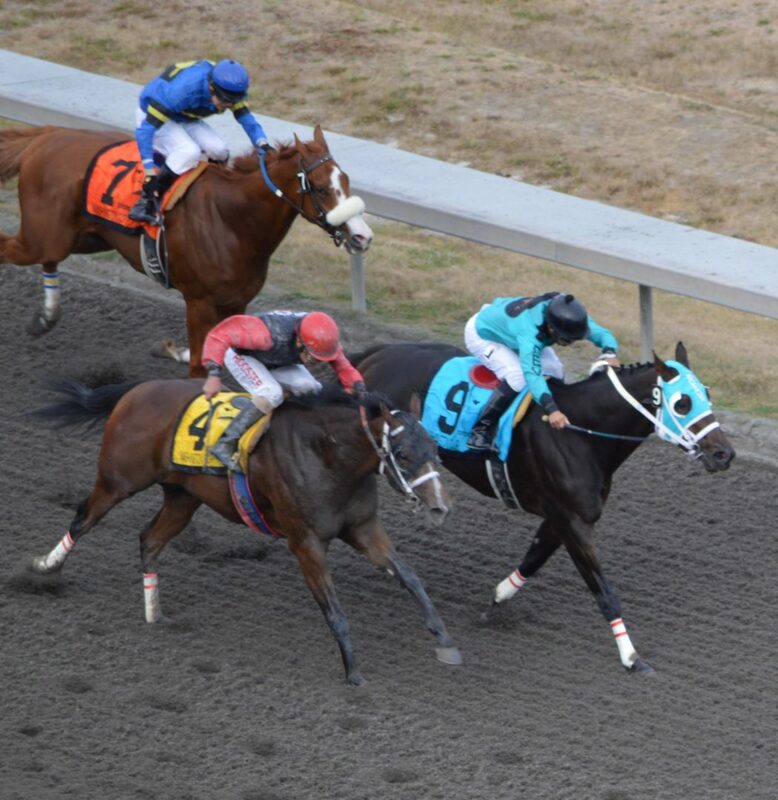 Lucarelli’s success at other tracks than home base Emerald Downs continued to rise in added money races as Point of Reference won at Sacramento. Meantime his chase of the ultimate win in the PNW, the Longacres Mile remained illusive as Posse Power settled for 3rd in 2011. 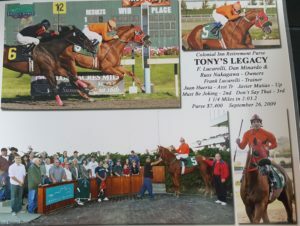 He would finish 2011 with 1 final Stakes win with Point of Reference at Fresno in early October. Lucarelli would also finish with more than 100 wins at 102 for the 1st and only time in his career while starting a career record 591. Over the past 4 full seasons his yearly starts has declined from 465 in 2014 down to 379 in 2017. He says the horse population continues to be a big issue but even more are a lack of owners. He says his horse base has fallen over the past 4 years because he has had owners literally pass away and the families liquidate their stables and there is no one to replace them. On the flip side, Lucarelli is far more effective with his starts as his average earnings per start have never been high than over the past 4 years. Lucarelli is a 5-time Emerald training Champion, has won multiple graded stakes, is 1 win away from tying for the all-time training lead at Emerald, has won Stakes races at multiple tracks and has had 2 horses run on the biggest race day in the World, the Breeders Cup. But the Longacres Mile continues to be his White Whale. His closest race was the 2012 Mile with Winning Machine missing by a head to Taylor Said. Jockey Javier Matias went to the lead with Winning Machine and Taylor Said hooked him at the 3/16th’s pole and the 2 vied for one of the more memorable stretch runs in Mile history (See below). One of Mach One Rules #9 and Barkley’s #4 Showdowns. Mach One Rules has been Lucarelli’s biggest hope over the past few years. Mach One Rules and Barkley had a memorable rivalry as 3-year-olds in 2016 where Mach One Rules played the part of Alydar in the famous 1978 rivalry of Alydar and Affirmed. Barkley like Affirmed seemed to get Mach One at every turn in 2016 but last year Mach One Rules turned the tables on Barkley. Mach One Rules took the Budweiser and Muckleshoot Tribal Classic. Mach One also beat Barkely in the Longacres Mile but could not get past the winner Gold Rush Dancer denying Lucarelli that Longacres Mile victory. Lucarelli is off to another solid start in 2018 and as you will read further will understand why I never used the word haunt in describing Lucarelli’s lack of a Mile win because it doesn’t haunt him. He says of course he wants to win it but he is more than comfortable with what he and his team including his wife and boys have achieved as a professional horse trainer and nothing can take away the happiness, the joy and the achievements they have already accomplished. Frank Lucarelli graduated from Newport High School in Bellevue where he met his future wife Pam during their Senior year in 1975. 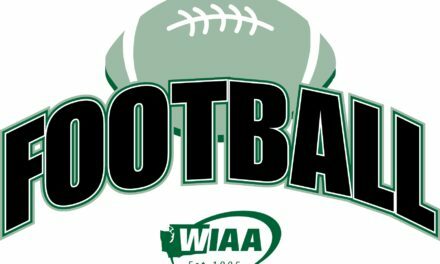 The 2 would go separate ways after High School, Pam headed to Pullman to attend WSU. Frank was a serious pitching prospect but hurt his arm and attended Big Bend CC for a year and then 2 years at Western Washington. He continued to draw attention and would then go pitch in an independent league for the Victoria Mussels. He eventually ended up in Bakersfield and was released in August of 1979. It was then he decided to turn his attention to horse racing and returned home to get his trainer’s license and went right to work. Pam attended WSU for a couple of years but then decided to keep her summer job as an assistant manager at Jay Jacobs and entered the workforce fulltime. This would be one of many jobs Pam has worked in over the years. Frank will flat out say without Pam’s work ethic his dream of being a trainer simply would not have happened. It was her ability to earn enough to pay the bills and maintain what would ultimately be a very critical benefit in health care. The couple would finally marry in 1981 and lived in an apartment near Factoria Square. Early on like many trainers getting their start it is not uncommon for an owner to become impatient and decide they want to go with another trainer. This of course happened to Frank but one of his firings led to a down payment for their first home and 5-acre farm in Enumclaw. When this particular owner fired him he told Frank he could have this one particular horse he felt wasn’t going to amount to much. Frank agreed but took the filly anyway. But the horse named Miss Sleater Kinney would surprise Frank and Pam and would win twice and placed several times in 1982 and the Lucarelli’s earned enough off of her alone to make a down payment on their first home. 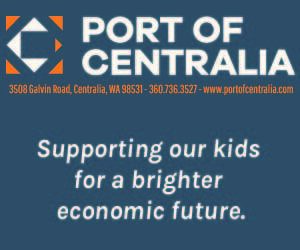 The Lucarelli’s worked their business with Pam handling the books plus working on the side from full time jobs to babysitting to make sure they could make ends meet. It wouldn’t be until 1988 when they would welcome their 1st of two sons, Anthony “Tony” Vincent Lucarelli. Then in 1992 Michael John joined the Lucarelli bunch. It was at this time Frank and Pam felt it was time to make a move and downsize. They were bringing home their 2nd son, Tony was 5 and he wanted to spend more time with his family and not bring work home. So they decided to sell the farm and bought a home on a cul-de-sac in a nice neighborhood. Frank says he wanted a situation for his boys to be able to go outside and hang out with friends and be close to them like his childhood. They still live in the same house with no plans to go anywhere else. 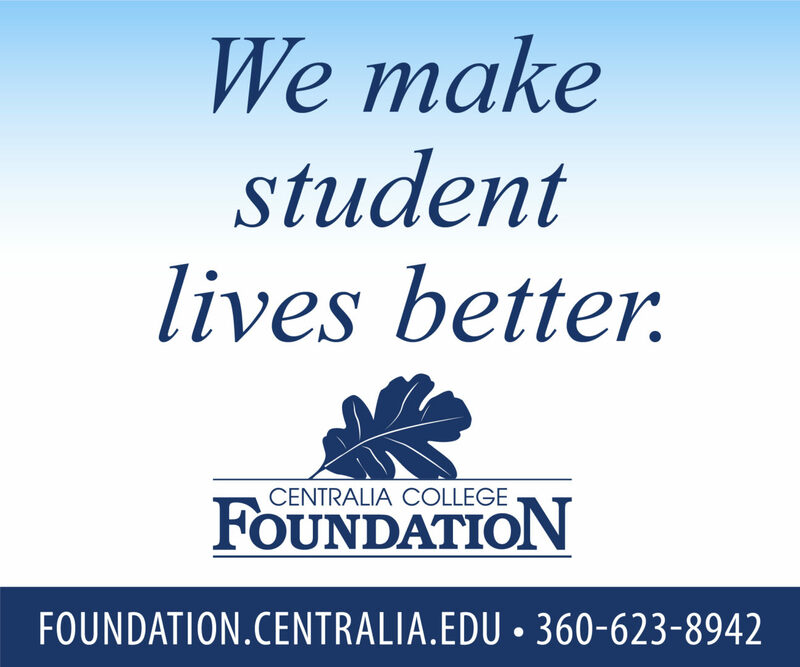 Michael is now 25 years-old and lives and works in Portland after graduating from Enumclaw High School in 2011. 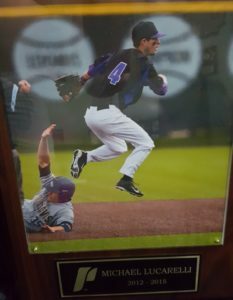 He was a highly touted shortstop and played for the Hornets while his Dad was the Hornets pitching coach. Michael went on to play 4-years at the University of Portland. 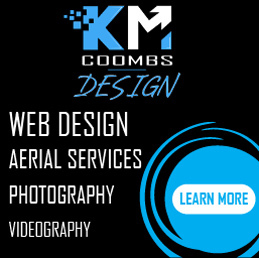 He now works for Logical Position in digital marketing in Portland. Frank says Michael was tempted to follow in his dad’s footsteps but Frank and Pam urged him to go into profession that is more stable. Frank told his son that doesn’t mean he can’t be part of the game and he is as an owner of a horse and lets his dad get up at the crack of dawn to train and take care of the day-to-day operations. Frank’s 1st son Tony was 5-years older than Michael and every parents nightmare began with Tony in October of 1997. 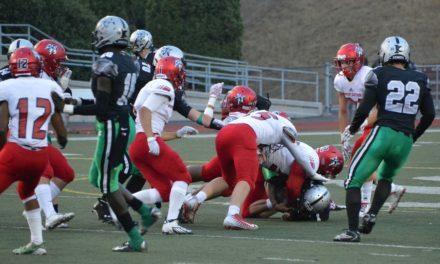 He was in the 3rd grade and began to experience severe headaches. Frank and Pam were just beginning a long journey with their son but didn’t know it at the time. They were concerned but the headaches would come and go. Then he began walking with a limp which really alarmed the Lucarelli’s and they began taking Tony to the doctor. Then in April of 1998 his right hand froze on Good Friday of all days. This was April 10th and following an MRI they were told there was a giant mass in Tony’s brain. Doctor’s told the couple to take him to Mary Bridge Children’s Hospital in Tacoma right away or they could call an ambulance. Frank said he didn’t want an ambulance to take him in and they drove him there where he would go into emergency surgery the next day. On April 11th Frank is sitting with his son before the surgery telling him when it’s all over he will be there waiting for him. The person you are going to see first is me he told his son. In the meantime, doctors were honest with the Lucarelli’s saying they were not sure what the mass is going to look like when they get in there and unsure how it will impact him and there could be some memory issues and he may not recognize anyone when he comes out of it. The warning was to prepare the family for a worst case scenario and so they wouldn’t be caught off guard if indeed that happened. After 8 and half hours of surgery the doctors came out and told them he was now in recovery in the ICU. Frank told the doctor he needed to get to his son’s side so when he wakes up he can fulfill his promise and be there for him. Frank sat down next to his boy and it was just a few minutes when Tony opened his eyes. When he did Frank was hoping he would recognize him and quickly learned the result when he told his son, “see Tony I am here. I told you I would be here for you when your first wake up.” Frank in telling me this story then laughed and teared up at the same time when he relayed his son’s response in our interview. He said Tony looked at him and said…”I woke up 10 minutes ago and you weren’t here.” Frank said there could have been no better response and knew his little boy recognized his Dad. Following surgery Tony underwent chemo and radiation therapies and when the remaining part of the tumor was shrunk down to the size of a grape they went back in and removed it and Tony was cancer free. He was able to go back to school and was playing baseball again although he never lost the limp. Then in 2000 during a regular check-up they found another mass growing on the cerebellum. There would be another surgery and another round of chemo and radiation and again it appeared he beat it. The date was 9/11/2001 and the day of a national tragedy with terrorist attacks on the Wold Trade Center Towers in New York. 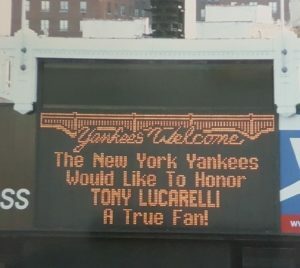 Meantime, on that same day the Lucarelli’s suffered another gut punch with the discovery of cancer now in Tony’s spine. They tried an experimental treatment that injected chemo into the spine. It was at this time that Frank and Pam wanted to know where they should take Tony for the best possible chance at beating this and it was recommended they go to Duke University in North Carolina. They took Tony to Duke but by the time they got there in 2002 the cancer had spread to his brain stem and there was nothing that could be done. The Lucarelli’s continued to take Tony to treatments of anything that might help but his condition progressively got worse. 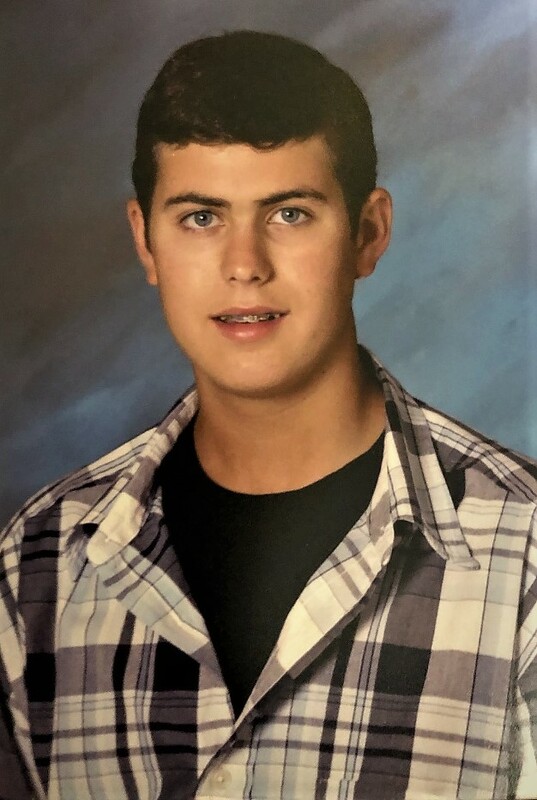 He became more paralyzed over time, the Lucarelli’s think it may have been a combination of the cancer and the experimental treatment of chemo in the spinal chord. Eventually Tony had to use a wheelchair. Tony would pass on October 25, 2005 after his condition worsened and he got pneumonia. Frank and Pam said as bad as all this sounds and it is a tragic situation they wanted to also say there were really good times during Tony’s illness. They give the Make-A-Wish Foundation a ton of credit for helping them give Tony and the Lucarelli family some tremendous memories. Through Make-a-Wish they were able to go to New York and see a Yankees Play-off game and a World Series game. Yankee owner George Steinbrenner donated one of his boxes to the Lucarelli’s for both games. Tony became a Yankees fan early on because of his Grandfather. Even after Tony had passed the Yankees took time to remember him with a message on their reader board. 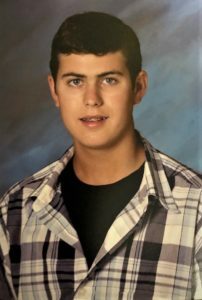 Tony continued to attend High School during this time as well and began competing in wheelchair basketball and tennis. 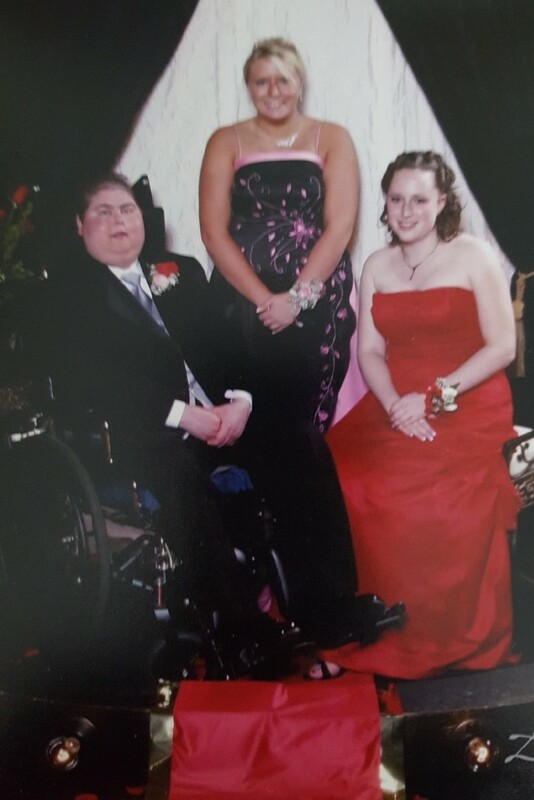 Frank said 2 young ladies from his class took him to prom prior to his death during his junior year. I asked Frank if Tony and the family knew that this was not going to end like they hoped and with tears in his eyes he said the hardest moment during this 8 year ordeal came when his son asked him if he was going to die. Frank said he didn’t want to lie and at the same time not only wanted but needed to believe there was an answer and told his son he didn’t know. He later would tell Tony I would do anything to trade places with you and Frank and Pam said in typical Tony told his Dad he wouldn’t let him do it if it were possible. Frank said his son Tony has had a lasting impact on a lot of people but most of all himself. He says this type of situation gives you real perspective about whats important in life and whats not. He says his competitiveness would come out when a horse he thought that should have won finished 3rd and now instead of kicking a garbage can and being upset he says I think well 3rd isn’t bad and we can correct what went wrong. He says don’t get me wrong I want every single horse in my care to be successful and I want my owners to have lots of wins but Tony reminds me on a daily basis of my priorities. Pam said Tony’s impact on his brother Michael has also been permanent. Pam said it was really sad to think that Michael’s only clear memories of Tony is when he was sick. Michael was 5 when Tony got sick and he died just a few weeks after Michael’s 13th birthday. Pam said Michael did everything he could to help and in fact during one of Tony’s wheelchair basketball games they needed another player so Michael jumped in and got to play with his big brother and did so in a wheelchair. 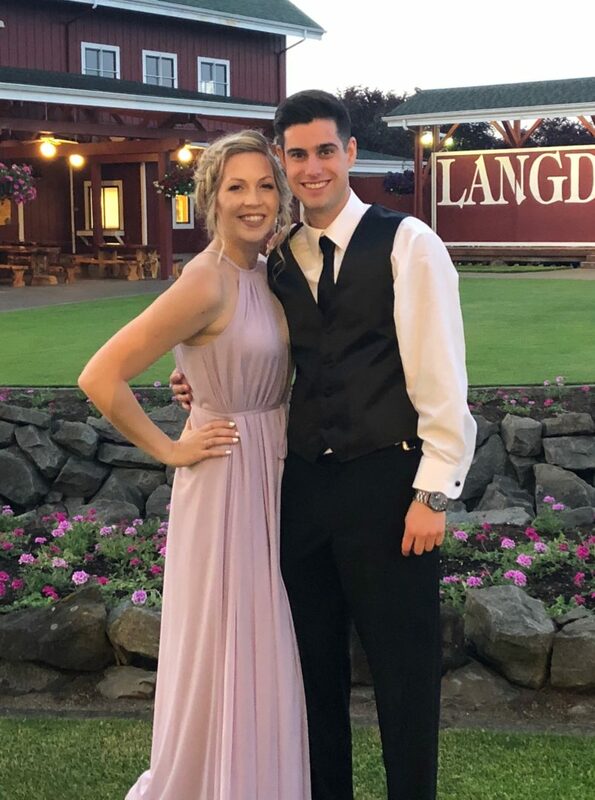 Tony also had an impact on his classmates at Enumclaw High School and just 10 days prior to his death 2 young ladies took Tony to the Homecoming Dance. Frank and Pam said he was just that type of person where you just liked him instantly and he was especially kind and giving. Tony had one more big surprise for his parents and thanks to family friend Carrie Howard and with some guidance from the beyond they pulled it off. In fact they pulled it off so well none of them had talked about how it all happened. Let’s start from the beginning of how Carrie and the Lucarelli’s became friends and what led to this surprise. They became friends through Tony and Carrie’s son Joshua who were friends in kindergarten and remained friends all through school. The boys were on the same baseball teams beginning with tee-ball. 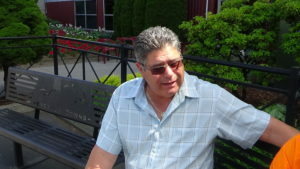 Frank was the boys little league coach at one point so the Howard’s and Lucarelli’s had been friends for quite some time and were well aware of the issues Tony had dealt with from the beginning. Carrie’s husband Bert also had medical issues including kidney failure and he had a kidney transplant. 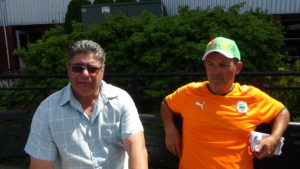 The transplant did not work and during the summer of 2005 both Bert Howard and Tony Lucarelli were facing extremely difficult medical issues. Carrie remembers relying on Pam and Frank for support and she tried to be there for them. She says during this time we really leaned on each other. Bert would pass away in September of 2005 about 6-weeks prior to Tony’s death. Carrie had been helping Pam with Tony’s daily needs when Frank wasn’t home simply because Tony was too heavy for Pam to help him in the bathroom or even getting out of bed. Pam says Tony was embarrassed that he needed help and was always apologizing. Carrie says she really tried to come at helping Tony like a caregiver would, keep it professional as she knew he was embarrassed by needing the help. Carrie had begun helping Pam quite awhile before Bert passed and over time Tony felt comfortable with her and they ended up with their own friendship that Carrie says is special to this day. The big surprise actually began just prior to Mother’s Day in 2005 when Carrie asked Tony if he would like to give a necklace or some kind of piece of jewelry to his mom and he said yes. So she brought over 5 or 6 different necklaces she had to see if he liked any of them and he picked out a necklace with a heart. Carrie says she then had the idea of getting something for Frank and Michael too and asked Tony if he’d like to give an ID bracelet with something engraved on them and he was excited about that idea. The two of them then took their time over the Summer in picking out the bracelets and figuring out what to have engraved on them. Carrie brought Tony a catalogue from one of the jewelry stores in Enumclaw. She said he would look through it and finally decided which bracelets he would get for each of them. Next they worked on the engraving and on Frank and Pam’s he had written, “I will be with you always, Love Tony” and on Michael’s wrote “Brothers Forever”. So Carrie ordered them and the plan was for Tony to give them to his family for Christmas and when they arrived Carrie held on to the 3 bracelets. Now this is where things get a little crazy, first Bert passed and then Tony 6-weeks later on October 25th. Carrie is dealing with the grief of her husband along with their son Josh and then both now have to deal with even more grief with the loss of Tony. Carrie says her time in helping with Tony not only created a special friendship with Tony and the Lucarelli’s but also helped her deal with the grief but now what to do with the bracelets. She knew the grief the Lucarelli’s were feeling with the loss of their son and felt this was not the time to give them the bracelets. She thought to herself the plan was for Christmas so she held on to them until Christmas. Again, remember neither Carrie, Pam or Frank have ever talked about how the bracelet idea came to be so on December 21st, Tony’s birthday, Carrie called and left a message for the Lucarelli’s she had something for them from Tony and had left the packages on the Lucarelli front porch. Now here’s the kicker…Carrie had no idea the 21st was Tony’s birthday and the plan was for this to be Tony’s Christmas present to them. For 13 years the Lucarelli’s have believed the plan was for those presents to be delivered on Tony’s birthday. Carrie says she can’t remember why she needed to drop them off on that day and thinks that maybe Tony and Bert had something to do with her having to drop them off on that day. Carrie remembers Tony really liking Bert and that Bert thought the world of Tony. She at one point told Tony to say hi to Bert for her and that no doubt he will be there waiting for you with the rest of your family. Thinking back maybe this was the sign that Tony delivered her message. Pam said she has had her bracelet buffed and re-engraved while Frank said the Dad on the top side of his bracelet has rubbed off but he has not taken it off since he got it. Michael keeps his but also had a dog tag made with the “Brothers Forever” on it to keep his brother close to his heart and wears it on a daily basis. Carrie says that period of time was so difficult yet filled with so much love she has treasured those moments and felt privileged to be able to fulfill Tony’s wishes. She says that experience certainly put life in perspective and believes it had a big impact on her son Josh. 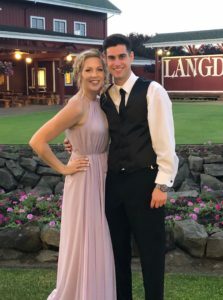 She says although they have never talked about it directly she says Josh was a focused student and graduated from Enumclaw High School, attended the University of Washington and then went back to law school at Seattle U and is now an attorney after passing his the bar exam last year. He was also recently married to his High School sweetheart, Bethany last September. Carrie says she can’t remember telling anyone this story and felt it wasn’t her place to do so until the right time. She thinks the world of the Lucarelli’s and felt this was the time share what happened. 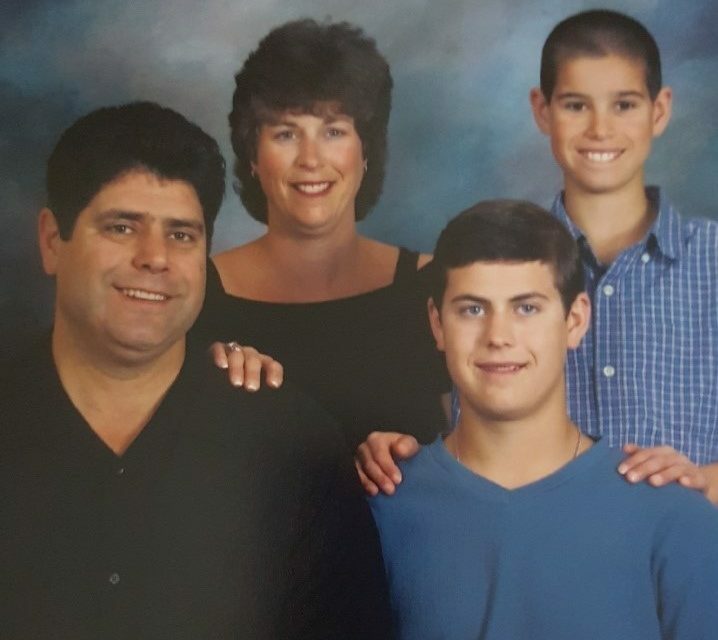 Despite the tragic loss of their son Tony, the Lucarelli’s say they are living a pretty blessed life with 2 great kids and being able to make a living at doing what he loves to do. Frank gives a ton of credit to his wife Pam. She took care of mountains of paperwork, got Tony to doctor appointments, worked at several jobs during tough times and is simply his best friend. He said I am nothing without Pam. He says going through this kind of event many times they were told it actually splits a family apart. Frank says he can’t imagine going through this without Pam and they relied on each other to get through some exceptionally tough times. But both are so quick to point to the positive and that they had many good times that are always what they remember first and foremost. Frank says not a day goes by that he doesn’t think of Tony and especially when he wins a race. He says Tony would get so excited when he won a race and couldn’t wait to ask how they did on days he didn’t get to go to the races. Frank isn’t worried about winning the Longacres Mile, he isn’t worried about making the payments, he isn’t worried about day-to-day operations of his business, he has a lot of great people who he has surrounded himself with and has brought that family-team feeling to his barns. Frank Lucarelli has a life many should envy he has the love of his life on his arm, he loves what he does and is successful to say the least, he has a great son who has already spread his wings and will one day make him a doting Grandpa and he will never ever be alone, just look at his wrist next time you see him and Tony will be right at his side, forever. That’s a pretty good life.